I used to live in a dream house before my parents divorced. It was a dream house because it was made of stones, had a fireplace, and a sunny terrace with hammocks on it. The house was in Villefranche sur Mer on the hills above the sea. From there, we could see the bay and the Mediterranean stretching to the horizon. My dad stayed in the house after the divorce and I went to live with my mum. I would still go to the house often, but it wasn’t ‘home’ anymore. Home was an apartment in Nice: no more walking to school among the trees, no more fires in the winter, and no more room with a view. Since then, I’ve often thought about my dream house. The one I’d have with my own family. I imagine how it’d look like in detail, wondering whether it’d be better to have one story or two, an open kitchen or a closed one, etc. Nick knows what a dream house is, too, because his parents live in one: it’s up on a hill overlooking dark green forests and golden fields, has a big common living space, a room with a piano and games in it, a TV room, enough bedrooms and bathrooms for a family, and a fireplace. There’s also a swimming pool, a jacuzzi, a tennis court, and a croquet field. Hard to beat that. So Nick and I agree on what a dream house is, but disagree on when we should start thinking of getting our own. While I’d rather stay mobile and mortgage-free for now, Nick is already attracted to the security and the certainty of ownership. He argues that a house would be like a base to return to and wouldn’t force us to stay in one place. Owning a house would represent a great achievement for him, and he already saved a decent amount of money towards that goal. Unfortunately, I didn’t make much money teaching French, and now I’m going back to school for a year. Besides, I don’t even know where I’d like the house to be: Switzerland where the cheapest house near Zurich would cost more than a million Francs? In New Zealand, far from my family and friends? Our different opinions on house ownership create arguments sometimes. But they also force us to reconsider our aspirations: maybe I need to save more and think about financial security, and Nick might enjoy the added flexibility of renting. In any case, our life is good and we’re pretty damn lucky to have a roof over our heads in a first world country. For now, we’ll just rent the little house at the bottom of the hill from Nick’s parents’s place. It is a mini dream house with enough room for both of us, a sunny deck, and a little fireplace. We might not own it, but we’re free to work on meaningful projects while we’re in it: I’m going back to university, and Nick works only part time and uses the other half of his time to work on his own start-up projects. With a mortgage, he’d have to work full time, and I would probably not have even considered becoming a journalist. We’re not in our dream house yet, but we’re in a house where we can live our dreams. And that’s probably more important. I am in that same situation at the moment with my husband. We are not in our dream house but this house we are in allows us the space and energy to create and to bloom. It is a bridge into the next level whenever that may be. Thank you for sharing your story. J’aime la maison où vous vivez vos rêves, Nick et toi. C’est un magnifique espace pour cette étape de votre vie. Cosy aussi. Après on verra… L’important c’est de vous y sentir bien maintenant. Check my blog on Monday. You have been nominated! Cecile, my husband and I are the same way. I try to tell him that rent isn’t “throwing money away”, it’s paying for flexibility. But he is eager to buy a house, regardless that we don’t even know where we want to live. He almost convinced me to buy a house in Vermont a couple years ago, just because we could afford it, even though we didn’t want to live there. Is it because our parents are divorced that you and I are more attracted to the idea of flexibility? Or maybe it is just that they are men that they need a house to feel secure. I’m glad to know that I’m not the only one having these discussions about property v. renting. My parents’s divorce definitely shaped my need for flexibility. At the same time, getting a dream house (and the dream family to go with it) represents a personal challenge: trying to do better than my parents. Your last two lines said it all. Wonderful piece of writing! I think the real question for both you and Nick is do you want a dream house or a dream home? They are not the same thing. I had your situation a few years back. We bought a house because it was always my husband’s dream. Guess what happened? The economy tanked and we lost the house. We did not loose the home because that is completely different. We are happy in a rental, we just decorate it and keep it as cozy as possible. Some projects are successful and some are not. We do have lots of love, laugther and great experiences. Maybe the next time you guys sit down and have a real conversation about what you want, you might have more common ground if you are looking for a dream home and then later, you can settle on a dream house. it’s a nice little house. I used to live in a dream house too, grew up in one, in a suburb in Sydney. 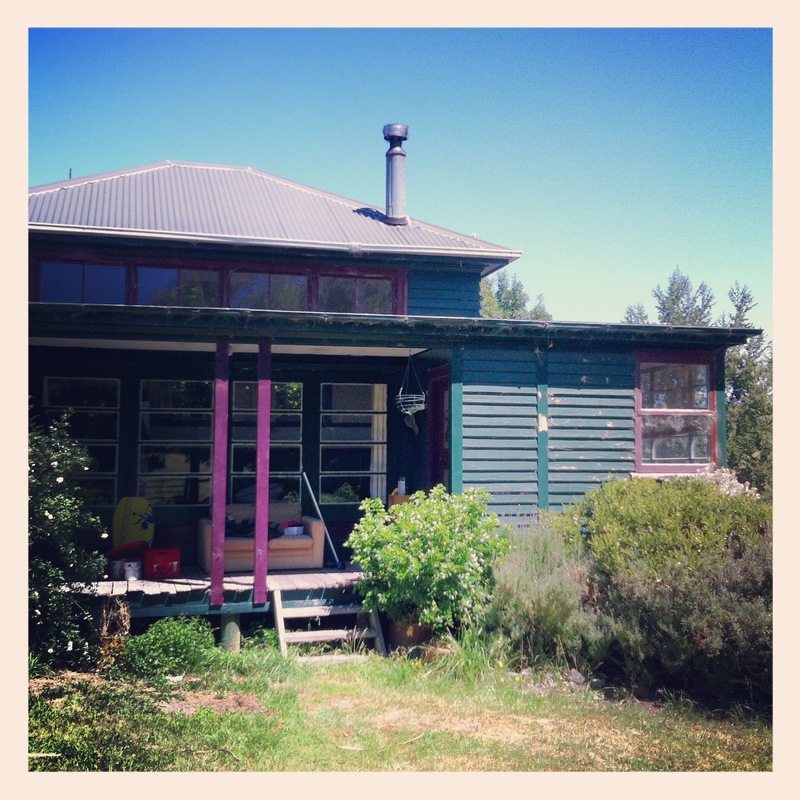 It had heaps of trees to climb up, sheds to go on the roof of, a back verandah we all used to draw on. It was huge. But you’re right, the dream’s more important than the house. My childhood’s house also had lots of trees to climb to. My favourite was the cherry tree in summer- delicious! The little cottage looks charming! I hope that you are enjoying sunny New Zealand and managing to keep home-sickness at bay! I don’t need much more than a fireplace and a sunny little deck actually :-) And we’re just a short walk away from Nick’s parents’s dream house anyway. Oh this struck such a chord! I’ve just signed a year’s lease on a flat in my home town – which, for a wanderer like me – is enough to strike terror into my heart and send me running for my passport! I’m constantly torn between my desire to settle and have a real (dream?) home, and my slightly stronger desire to stay untethered and be able to up-and-go at a moment’s notice! My tactic now is not to think too far ahead…and remind myself that it’s just a year! And that stuff can be stored, shipped or sold! I’m sure you’ll still be a wanderer at heart, even if you stay in one place for a bit longer .-) And yeah, all the stuff can be stored, shipped or sold- i know, i just did it! Loved the post and the personal thoughts you have brought in. What is it specifically from your childhood that is making you think of a dream house. Is it the serenity of the house structure and environment? Or is something more intrinsic in terms of happy memories? Which is the aspect which leads to the arguments you have with Nick? Thank you Shakti. You ask good questions and the answers could fill one or two posts! The dream of having my own house definitely comes from having had one in my childhood with some happy memories and then having to move out when I was 10. The arguments with Nick evolve around the financial security of owning a house vs the sacrifices we’d have to make in order to get it, and mobility vs staying in one place. Part of me has always wanted to just travel with my backpack, camera and journal taking in all the sights and sounds out there. In my early twenties that dream faded into college, graduate school, marriage and a beautiful little girl (an amazing unexpected dream), then divorce yet still in the same home which feels more like the dream home of a previous version of myself. She and I call this house “heart home” it’s the birthplace of our family of two. With my little girl approaching 5, I look forward to taking her on more adventures. I say rent as long as you can until you know where you want to live, when you feel the gentle nudge to lay down some roots. It looks like you have a great resting point in the above abode complete with a porch and fireplace. Be well and best of luck with school! There is nothing better than living in a dream home, and that will come with time. Live your dreams now and build for the future. It will come. Pretty sure living your dreams is more important than a dream house just now. You’ll have all the time in the world to get a dream house when you have achieved and lived all your dreams. I’ve decided that what I should aim for are dream houses. Plural. One would be an in Basel overlooking the Rhein. Another would be in a red-brick Chelsea/South Kensington (London) terraced building. Another would be on a house along a quiet cobbled street in Philadelphia’s Old City – most likely with a rooftop terrace. There might be more, I remain open-minded. It’s all totally going to happen one day. Thanks, Claire. I guess patience and enjoying the perks of renting is what you need :-) I like to imagine my dream house, even it is stays just a dream. I hope you find your own little place soon! You write so well! I hope you’ll be very happy in NZ and wish you well. “We’re not in our dream house yet, but we’re in a house where we can live our dreams. And that’s probably more important.” I couldn’t agree with you more. I’m feeling quite like you, knowing the kind of house I want but not quite being ready to make it a reality, and I think that’s okay. Dare to live the dream that you two come up with together. Somehow, the life you lead might become the dream you always wanted. Your dreams are seldom about where you are. I now own, at 54, the first house I purchased. While it might have been nice to have one earlier, I had other things to do. Plan for your dream house, but leave the time schedule open. Do what you wish to do before the family and house make it so much more difficult. Just remember that “reviewing” does not mean always giving in. It’s a really cool house, I must say :-) We’re still painting and cleaning it at the moment- I can’t wait to move in! I bet an apartment in Paris would be a dream for many people as well. “We’re not in our dream house yet, but we’re in a house where we can live our dreams.” This is beautifully stated. My dream house has two levels and huge windows, and a bedroom with a view of the morning sunrise. I used to have that in the apartment I lived in before I moved in with my boyfriend. He owns his home, and would lose a whole lot of money if he sold it now in the U.S. housing market. So, we too are living our dreams together in a home that neither would describe as our dream. So it goes, right? For what it’s worth, your new home looks adorable, breezy, and wonderful. I live in a house with two levels, huge windows and a view of the city and harbour over to the East. Thank you for making me appreciate it, as I’ve been taking it for granted. My dream house looks a bit like yours :-) Being with the right person sure counts more than living in the dream house, and it’s good to have a common project to look forward to. This is the most precious mini dream house! I love all the colors and I’m jealous you have a fireplace. We rent right now too, and while I certainly dream of that one-day house, it’s fun practicing in a place that’s temporary. We are free to make all the mistakes, while storing away lessons of what worked right. I’m excited about your adventure back to the university to pursue journalism! Thanks, Jane. Yeah, the house is really cool. It used to be a school, so there are still some old blackboard in there- it’s got a lot of character. Love it Cecile.. The road to this dream home went through many stages and houses, all with good lives lived in them and good memories created.